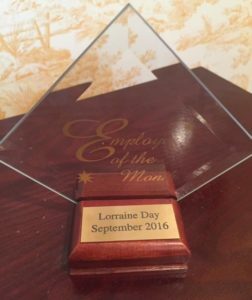 Congratulations Lorraine Day: September 2016 Employee of the Month at Sterling Healthcare & Rehabilitation Center! A 10 year Employee of Sterling Healthcare & Rehabilitation, Lorraine is a Therapy Assistant in our Rehabilitation Department as well as our evening Receptionist. 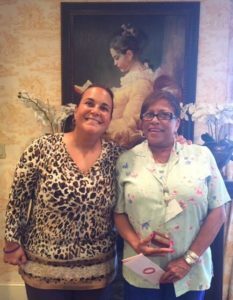 Lorraine’s warm welcoming smile and enthusiasm for life are infectious to our Residents, their families – and the entire the staff! Pictured below: On the right Lorraine Day and Gladys Christopher Administrator at Sterling. ← A Sterling Presence at the Senior Expo!